In searching for ways to keep the kids busy during the summer months, whether it be a beautiful sunny day, or a rainy day indoors, I have found that a simple can of shaving cream can evoke all the smiles and laughter you can imagine for kids. Not sure what it is about the fresh smelling fluffy stuff, but my kids love it and the activities that we do with it on any occasion. We use it for crafts, painting, and sensory play on rainy days, but on bright sunny days it is a cheap way for the kids to have a really good time! A can of shaving cream costs a dollar or less, but the smiles it evokes from the kids is totally priceless. 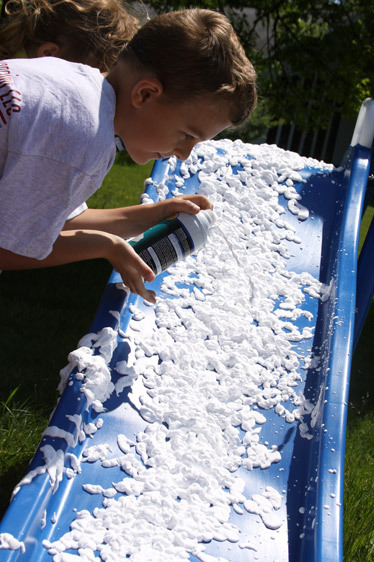 For this summer fun activity all you will need is a slide of any shape or size, and a few cans of shaving cream. This IS my kid’s favorite summer activity to date. This activity is pretty self explanatory, and the pictures speak volumes about how much fun it was for the kids! Before this activity I didn’t share with the kids what we were up to. It was on our summer fun list this year and they knew we were heading outside to cross something of the list, but they weren’t sure what it was until we did it. I took a dollar store table cloth and laid it at the end of our slide outside and had a bag containing the secret ingredient to fun all ready to go. Upon revealing to the kids what the secret ingredient was, there was a ton of excitement in the air. Like I mentioned earlier, they love to play with shaving cream. Whether it be in the tub, doing crafts, or painting projects, they love everything about playing with it. This time though, it was intended to be a full body plunge down the slide that ends with them just covered in it! What’s not to love? 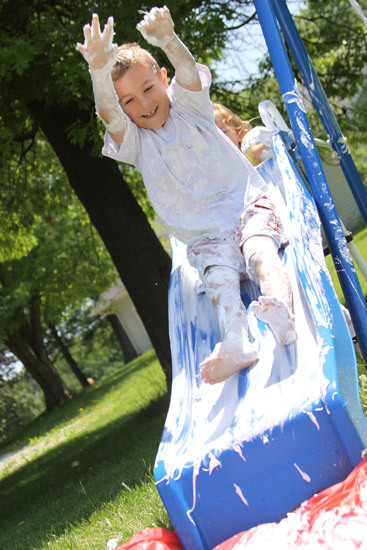 We had 3 cans of shaving cream to use up this particular day so the kids got to work covering the slide with it. The anticipation of the first slide was as fun for me as it was for the kids. Then it was time to let the shaving cream slide party begin. I plopped myself at the end of the table cloth with my camera to save the kids from skidding across the grass and to grab a few shots of the silly shaving cream covered fun. I got more fantastic pictures than I can share, and the kids laughed, smiled, slid and smiled their hearts out for a good hour! I am certain, had we had a few more cans of shaving cream, that this would have gone on all day long! When I ask the kids what their favorite summer fun activity has been throughout the last few years…This is it!!! The few bucks that I spent on shaving cream was WELL worth the fun that the kids had that day, and like I said, the smiles and laughter are completely contagious and totally priceless! 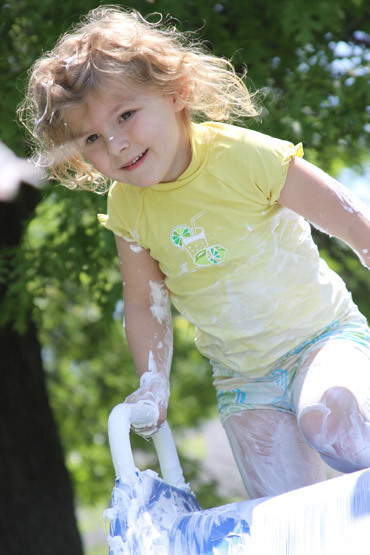 If you need a fun summer time activity that your kids will never forget – stop and get some shaving cream! It is sure to be a hoot no matter how old your kids are! Please be sure and supervise this entire process- especially if your kids are toddlers! 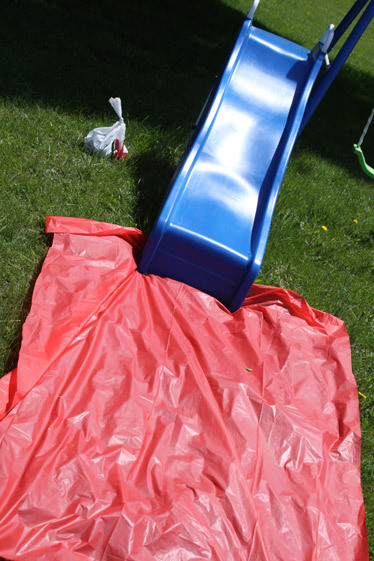 The slide and the table cloth get VERY slippery and they will need help getting up and down the slide steps after they are covered in shaving cream. You don’t want anyone getting hurt or slipping off the stairs. My kids loved the idea of slipping, sliding, and falling all over because it was silly fun, but I was always right their making sure that they were safe.